After your network is up and running, measure success to understand your groups' engagement and activity, and inform your efforts to improve, grow, or execute campaigns in your groups. 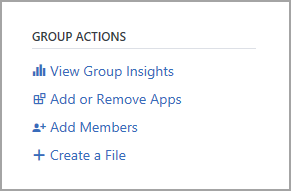 Anyone within a group can view group insights by selecting View Group Insights. From the Group Insights drop-down, you can select to view activity for the last 7 days, 28 days, or 12 months. 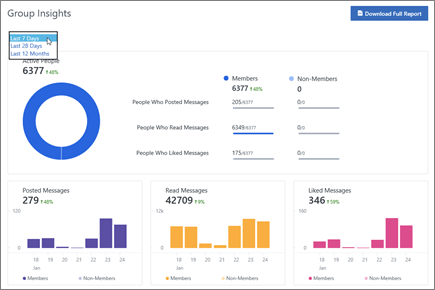 Group insights also show you how activities are trending over time. The visualized trends show the contributions to activity of the group, to help you track engagement with content from campaigns or initiatives hosted on Yammer, report back to leaders, and optimize efforts. Identify key stakeholders - Create a dynamic team of the right people to drive and effect change. Identify & prioritize business scenarios - Determine how your organization will use Office 365 to address your business goals and challenges. Create success plan - Create a plan for realizing your goals with Office 365. Execute success plan - Implement Office 365 in your organization. Sustainment - Drive ongoing adoption, manage change, measure and share success. This guide also provides useful templates, tips, and links to resources. Talk to thousands of other Microsoft customers as part of the driving adoption community at http://aka.ms/DriveAdoption.